QRapping Paper – The Gift That Keeps On Giving | OhGizmo! By Andrew Liszewski on 12/06/10 • Leave a comment! Besides making even a gifted box of hand towels look techno-cool, this QRapping Paper (pronounced crapping?) is covered in a grid of QR codes that actually work. On each 20×30 inch sheet there are over 50 of the codes that link to festive videos like drunken carolers, car vs. fruitcake and ornament smoothie. 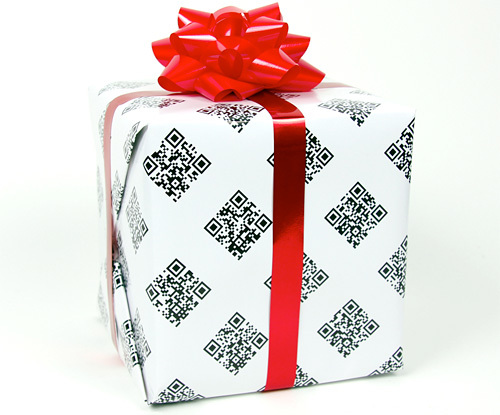 Now obviously the giftee will need to have a camera-equipped smartphone with a QR code reading app installed, so it might not be the perfect gift wrap for all of your friends and family. But since 2 sheets of the stuff will cost you $19.99, you’d probably want to be really selective with it anyways.